In dealing with the financial meltdown of an investment bank, J.C. Chandor’s directorial debut “Margin Call” in 2011, was an impressively handled, fast paced and very dialogue driven film. It also had a who’s who of familiar actors as they wheeled and dealed their way out of their crisis with a spot of verbal jousting. Now, in only his second feature, Chandor has left all that behind and delivers a film that couldn’t be further from his debut. There’s only one actor and you’re lucky if you get a couple of lines of dialogue in the entire film. 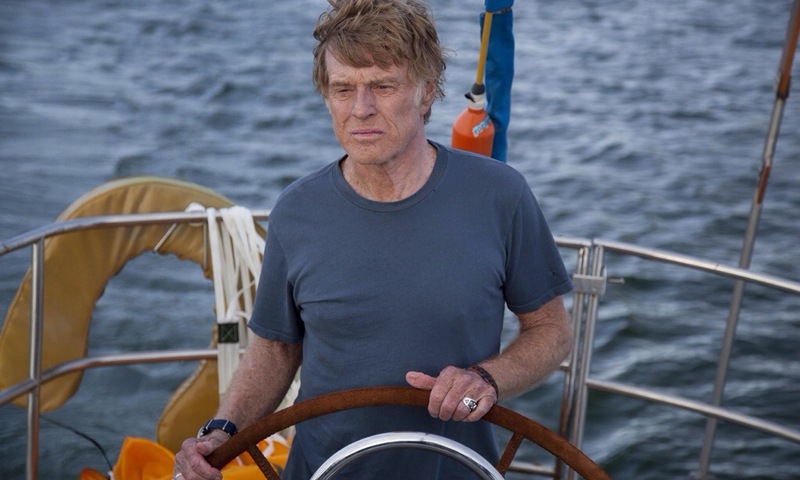 In the Indian Ocean, a man (Robert Redford) wakes up on his yacht to find that a shipping container – that has been left adrift in the seas – has collided with him. It’s ripped a hole in his hull and he’s quickly taking in water. He manages to patch it up but a violent storm brings yet more problems and soon, time is running out for him. As the film opens we are told that it is 1700 nautical miles from the Sumatra straits. That’s about all we get in determining where our protagonist is. He’s never actually named either – referred only as ‘Our Man’ in the end credits – so we don’t know who he is or why he’s there, other than some brief voiceover dialogue informing us that he’s sorry for something. Again, we don’t know what he’s done or who he’s apologising to – possibly his family. Either way, he’s alone on his yacht and we don’t know where he’s heading to. That’s about as much information as we are given and it doesn’t get any clearer. It’s this very ambiguity that sets the films tone; it doesn’t concern itself with details or backstory or even much dialogue for that matter. 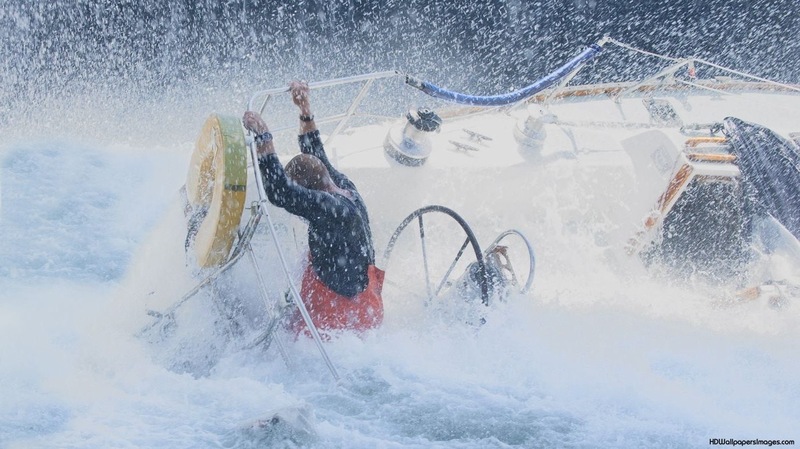 This is a meditation on human resilience and determination. Anything else other than that leaves us just as alone as our nameless protagonist. Chandor’s intention is to obviously keep things at a minimum and force us to look for the film’s themes. Finding these themes, though, is just as elusive as our characters chances of survival. Maybe I missed the point, but all I could find here was the was he was going through some form of penance for his past misdeeds or that the story is an allegory for mortality. Other than that, I felt as lost as him and could fully relate to the film’s appropriate title. That being said, there’s still much to admire here. Chandor’s minimalist approach manages to balance the vast open space with a real sense of claustrophobia and Redford’s paired down performance is absolutely captivating. He has such a comforting and recognisable presence that it’s easy to adapt to his character and his isolation. It takes a great actor to be able to hold your attention when they are practically saying nothing and completely carrying a film on their own. 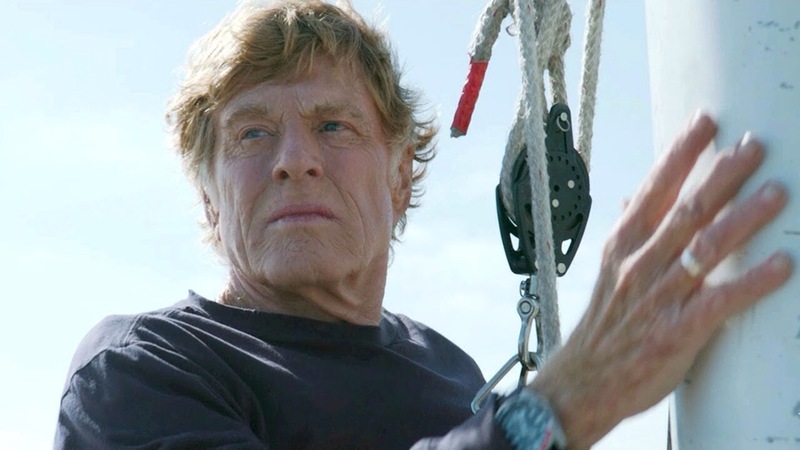 Redford’s work here is reminiscent of Tom Hanks’ exemplary and Oscar nominated performance in “Cast Away” and it’s hard to accept that he missed out on an nomination himself, when many expected him to feature. His performance is a very physical one and all the more impressive considering he’s now at the tail-end of his 70’s. It’s a lonely and gruelling journey and despite the lack of dialogue, Redford’s subtlety speaks volumes. It’s almost as if we we can hear his internal dialogue and the conversation he’s continually having with himself. There is much to recommend this film but if there’s one reason to see it, it would be for Redford. Most of the ingredients are here for a potential modern classic. Chandor’s direction is impressive, as is Redford’s outstanding central performance. Alex Ebert also conducts a wonderfully ethereal music score that compliments the powerful cinematography. 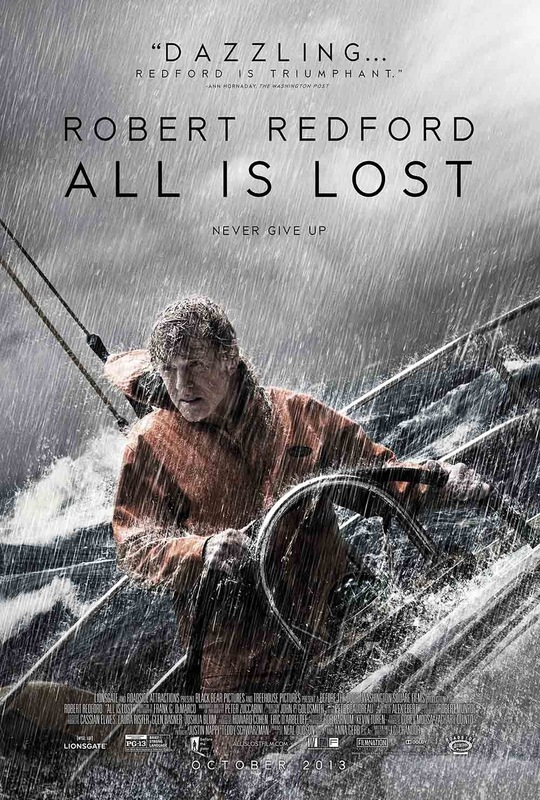 However, as much as I enjoyed “All Is Lost” for these attributes, I struggled with it’s relentlessness and couldn’t really see the point of it all. Trivia: In the beginning, the Chinese characters shown on the container (which is supposed to be the name of the shipping company) actually mean “good fortune”. This entry was posted on February 27, 2014 at 1:30 pm and is filed under Drama with tags 2013. You can follow any responses to this entry through the RSS 2.0 feed. You can leave a response, or trackback from your own site. Good stuff mate. Heard some really good things about this one, seems an interesting little premise. Definitely going to be giving this one a rental. Cheers Chris. It definitely has a lot going for it and it’s minimalist approach is impressive but it still felt a little too distant to fully connect. Solid review Mark! I was a big fan of the film mostly for reasons you touched on. I was amazed at how intrigued I was with this man considering how little we are given. This was a rare case where I really appreciated the ambiguity. And Redford was stellar. There isn’t even a hint of his “Golden Boy” persona. This is a raw, stripped down, and powerful performance. Cheers man! The ambiguity worked for me too (for the most part) but like I mention in my review, I still struggled to see the point of it. There were obvious hints at this man facing his own mortality and how he’s conducted his relationships but I didn’t really see much else going on. It came across as if it had plenty of depth but really only resulted in a survival movie. That being said, it was brilliantly handled and played. Lol. Fair enough, Cindy. I can totally see where you’re coming from. There were times when I had this down as a 4 star movie and then kept deducting a star here and there. I eventually decided that it sat somewhere in the middle as I enjoyed Redford’s performance and thought the film was brilliantly shot. Still, I can see why some wouldn’t take to it at all. I by that I mean – why do I want to watch a guy on a boat for two hours? Haha! I understand completely! This isn’t for everyone. I did enjoy it for many reasons but it’s a bit gruelling at times and you do often wonder why you’re putting yourself through it. Interesting review Mark. I’ve heard a lot of positive reviews for this one but so far I haven’t managed to check it out. I imagine this could be a tough watch with the limited dialogue etc. Are you surprised Redford didn’t get an Oscar nom given that he carries this one so well all on his own? I’ve heard a lot of complaints about an Oscar ‘snub’. Cheers Natalie. Redford’s performance could be considered a snub. He is very good here but there were so many actors that got snubbed this year: Oscar Isaacs, Joaquin Phoenix, (haven’t seen Capt Phillips yet but from what I hear) Tom Hanks and one of my personal favourites… James McAvoy in Filth. Yea it was definitely a tough year. Pretty pleased with the result though. Haven’t seen Filth yet but will have to catch McAvoy’s performance soon. Great review Mark. Still need to see this one myself, though given the buzz around it, i was surprised to see it missing from most Oscar categories! Cheers Adam! Yeah, I can see why some would have expected it to feature in the nominations. Particularly Redford, but ultimately it didn’t quite have the quality to make it as a best Film nominee in my eyes. Redford was great here, which makes it a huge shame that he wasn’t nominated. However, I guess it was just too tough of a year for him to slip-on by. Good review Mark. Cheers Dan. I wouldn’t have argued with Redford reviewing a nomination but who could you actually omit for him to make it? A very strong year and Redford unfortunately finds himself along with so many others that could have made the cut. Nice review, Mark. I thought this one was pretty impressive myself. Cheers Chris. Yeah, I did enjoy this one but it also left me a little distant at times. I can see why some would absolutely love it though. Fair dues Mark. I found myself transfixed by Redford’s performance, the soundtrack, the narrative and Chandor’s sparing direction. I just felt this was pure unadulterated cinema. Really nice review, even though I enjoyed it that bit more. Thanks Mark. I was transfixed by Redford too and the soundtrack and direction were top drawer. It was the narrative that I found too elusive, though. I could appreciate what Chandor was doing but it felt a bit drawn out to me. Great review Mark. Keen to check this out when it opens here. Intrigued that Chandor has gone from such a chatty first film with Margin Call to this one. Thanks Tim. Yeah, Chandor’s two films couldn’t be any further apart. It looks like we have a very good director in our midst here. Can’t wait to see what he does next. loved this movie. Nice review Mark! Thanks Rob. It’s certainly a film that has split audiences. I didn’t enjoy it as much as some but there was still plenty to appreciate. Although it looked convincing I was utterly bored by it and had trouble getting through it. The audience I saw it with even laughed when the movie ended….not a fan myself. I enjoyed it for the most part, Nostra, but it was certainly sluggish and I never really caught the meaning of it, to be honest. I don’t think this film is as deep as many have claimed it to be but it was visually superb and I really enjoyed Redford’s work. Yeah and this was at a festival, so these were the type of people I’d imagine liking something like this…. At a festival no less? That is surprising. I didn’t find that bad but I do know some who have written it off as pretentious nonsense.